Fits most 1961–85 Ford cars and trucks (Mustang, Torino, Ranchero, Maverick, Comet, Fairlane, Falcon, Cyclone ,Cougar, Galaxie and other full-size Fords and Mercurys, Montego) with small-case alternator. For use with external voltage regulator. Includes with pulley and fan. 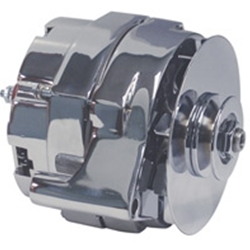 This high quality new alternator features excellent chrome plating. For one-wire alternator, see part number PA70-1. One-year warranty. Defective alternator must be returned in its original box. NOTE: Electrical parts are non-returnable once installed. We will replace defective units only.